So, a dear friend and I were Skypeing recently and she mentioned that she's finding the "40 Triangles" division to be tricky. Well, part of the reason may be because, though it's referred to as 40 Triangles (probably because of the 40 days of Lent), mathematically, it actually works out to be 48 triangles. And if you follow these steps, it's not too hard to achieve a nicely divided egg. First egg / Top row: The Gateway division is the first and most basic way to divide an egg. You are basically drawing three lines around your egg; one that circles it horizontally, and two that circle it vertically and cross at 90 degree angles. This divides your egg into 8 sections. Find them on your egg and count them. Don't forget, our egg will have 2 sides. The pictures above only show one side. Middle egg / Top row: The next step, as shown above, is to divide your egg into 16 sections by adding 2 crossed lines, evenly dividing your egg. 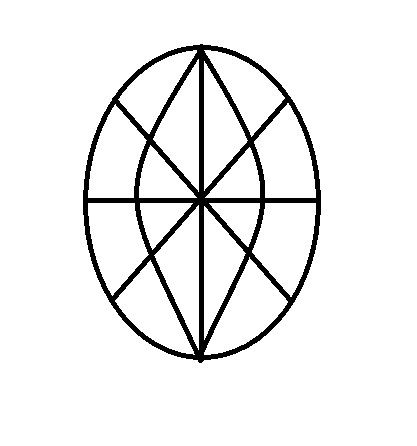 You might think of this as 4 lines, if that helps, but remember, they will circle your egg, so technically, they are 2 continuous lines. Now you should have 16 sections. Count them. Last egg / Top row: The third step is adding 2 more vertical lines (or 4, depending on how you think about it) vertically on your egg, evenly dividing your egg once again. You can do this by looking at the top and bottom of your egg and dividing it like a pizza. You should now have 32 sections. Count them. First egg / Bottom row: Your last step is to add 4 horizontal-ish lines that cross the intersections made by your vertical lines and your diagonal lines. Now you should have 48 triangles. I like to think of the 40 Triangle division as 48 Triangles. It's easier for my math brain to make the division correctly if I'm looking for groups of 8. You can see the easiest group of 8 colored above in the 2nd row middle egg. That group is orange. You can see the other groups of 8 in the last egg. Remember, the missing 4 triangles for most of the groups are on the backside of the egg. Good luck! This is a great division. You can read more about it here at pysanky.info, which is an amazing site.